Mosquitoes are a public health risk and a general nuisance for many people. 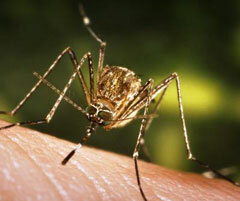 Mosquitoes carry and transmit eastern equine encephalitis (EEE) as well as several other diseases which have played a major role in our history. Likewise every summer mosquitoes provide a constant reminder of their annoyance when outside at parties, sporting events or just taking an evening stroll. They survive the harsh winters in our sewer lines and come spring they are just as eager as we are to get outside. Mosquitoes enjoy our parties as much as we do because they are attracted to CO2, carbon dioxide, what we exhale. This is the primary means of locating their food which is us. It is also produces from gas grills. So when you are standing in a crowd or near a gas grill after dusk you are standing in the mosquito zone. There are about 150 different species of mosquitoes in the United States. Only a few of these though are of concern because they carry disease organisms. Of those few we can narrow them down to females because males do not feed on blood. All have a few things in common, moisture. Our pest management professional will complete a pest susceptibility report. This report is focused on reducing areas that mosquitoes use to reproduce. This includes removing standing water in your yard including non-draining gutters, pool covers and hot tubs that are not open for the season. The technician will point out and empty watering cans, flower pots, buckets, tin cans, wheelbarrows or any object that can collect water. Once the inspection is completed Freedom Pest will treat high impact areas where mosquitoes are resting or staying cool. These products, either traditional pesticide or organic treatments are applied to wood lines, wood fences, shady lawn area, and ornamental plants as needed and are effective in mosquito and tick treatment. This treatment also has an insect growth regulator mixed in that will help prevent mosquito larva from molting into adults. Insect growth regulators reduce the need of adulticides needed for mosquito control. Standing water will be treated with “Bti”, Bacillus thuringienis, bacteria which infect and kill mosquito larvae. These bacteria are highly selective, killing only mosquitoes and their close relatives like gnats and black flies. Formulations of Bti will only kill these types of insects and do not harm other kinds of insects, fish, birds, worms or any mammals! When Bti are eaten by the mosquito larvae, they damage the gut cells and quickly paralyze them, then kill the larvae quickly and efficiently. A moderate to heavy dose has been shown to reduce the mosquito population by one half in 15 minutes and the rest within one hour. Treatments are scheduled and 21 days apart to be effective.